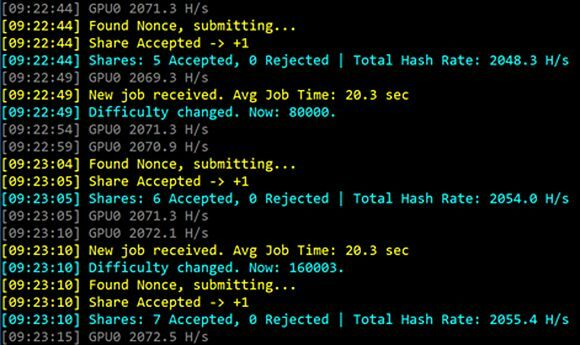 There is a new Monero (XMR) CryptoNight miner out for AMD Radeon Rx Vega GPUs called Cast XMR that claims to be capable of reaching hashrates of more than 2050 CryptoNight H/s on an single RX Vega 56 or Vega 64 GPU (with a high power consumption). The miner is designed to support CryptoNight/CryptoNote based currencies such as Monereo (XMR), Bytecoin (BCN), DigitalNote (XDN) and Intense (ITNS) to be used with RX Vega GPUs and. There is a 1.5% dev fee included and currently is is available only for Windows OS (binary), no source code due to the developer fee, though apparently a Linux version is also coming soon. According to the author of the miner is should be capable of providing you with about 1900 H/s at about 200W or over 2000 H/s at 250W of power usage, so if power and cooling is not an issue you might try to get the most out of your RX Vega GPU with this miner. To get the best performance you will need to use the AMD Blochchain Compute Driver (version is 17.30.1029) as well as to toggle the HBCC Memory Segment. While AMD’s new Radeon RX Vega GPUs are a bit buggy as far as mining goes and cause some headaches they are still doing great in terms of CryptoNight mining performance (when they work) and are also interesting option for Ethash dual mining as well, if you manage to keep them cool. Squeezing the best performance out of the RX Vega GPUs requires a lot of power usage and thus a lot of heat being generated, also getting more than 4 of these cards in a single mining rig is still a problem. AMD’s new Radeon RX VEGA 64 GPU is now officially out in the wild and we have some first impressions from it to share regarding crypto mining. There were various pieces of information and rumors regarding the mining performance of the new AMD VEGA, but since we got out hands on one we are going to share what are the actual out of the box results that we got from it. The new HBM2 memory used in the AMD VEGA GPUs is probably the most interesting part in the new product line, but unfortunately out of the box it does not do great in memory intensive algorithms. Of course we all know from AMD’s Polaris range that with some tweaks and modifications extra performance will most likely be available to miners, but that could take some time. Probably the most important performance that people what to know about is the hashrate for mining Ethereum (ETH) and other crypto coins based on the Ethash algorithm. 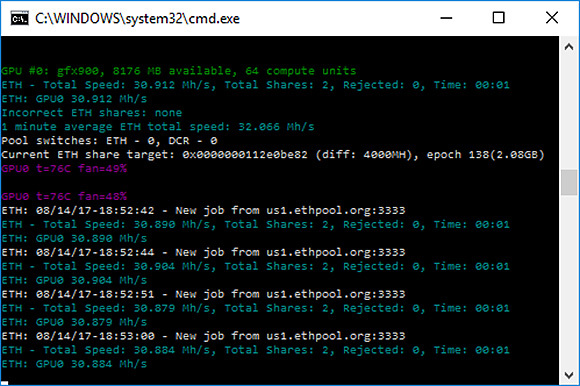 Unfortunately the out of the box performance from Radeon RX VEGA 64 using the latest Claymore Dual Eth miner that comes with official support for Vega is just around 31-32 MHS. We’ve seen claims of much higher performance being theoretically possible, but we are yet to confirm if it is and if these claims are actually real or just speculation. 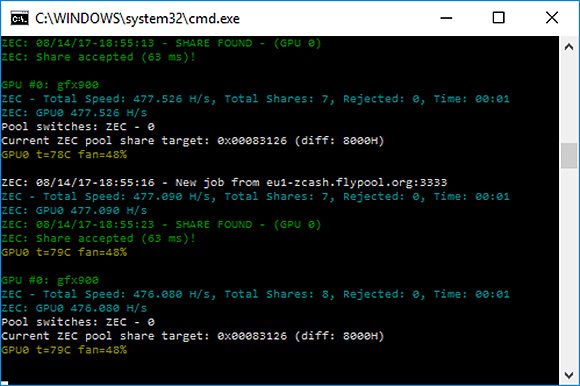 The not so great thing is that this hashrate is achieved with pretty high power consumption and the higher the temperature of the GPU goes, the lower the performance drops and it is really easy for the air cooler VEGA 64 to get hot. You can say that the new Radeon RX VEGA 64 GPU out of the box at stock settings does manage to perform very similar in terms of performance to what a well overclocked Nvidia GTX 1070 can also deliver for ETH and ZEC mining. The AMD GPU however does it with significantly more power used when compared to what the Nvidia card requires to provide very similar performance for mining (double the power for the VEGA). As far as gaming goes, the Radeon RX VEGA 64 is apparently closer to GTX 1080 in terms of performance, but then again it still consumes more power than the Nvidia card. What remains to be seen is what the initial availability is going to be and what the actual pricing of the new VEGA GPUs will be considering the fact that the demand from miners might not be that high, though you never know… with market prices of Polaris GPUs at the level they are available now the official recommended price of the VEGA 64 does seem unreasonably low, so expect higher initial prices for sure. On the other hand the Radeon RX VEGA 64 could also do better in more GPU intensive algorithms than it is doing for memory intensive ones. The option for dual mining with one memory-intensive and one GPU-intensive algorithm may also turn out to be pretty attractive alternative, even wiht the not so great performance in memory-intensive mining algorithms alone.